NetRewards® - All the latest Competitions from around Australia. Updated daily! Aldi Ski - Win over $30,000 worth of awesome prizes! Get ready, ALDI's amazing snow gear drops in stores Saturday 18th May. To celebrate, we've teamed up with Perisher to give away over $30,000 worth of awesome prizes. GRAND PRIZE: Win a 3 day Deluxe Family Snow Trip for 2 adults and 2 children, valued at over $8,000. 10 RUNNER-UP PRIZES: Win 1 of 10 Weekends for 2 People at Perisher, valued at up to $2,000 each! BONUS PRIZES: 3 lucky winners will receive 2-day Lift Passes, with access to all operating lifts at Perisher Ski Resort or you could also win 1 of 10 ALDI Gift Cards, valued at $100 each. Simply enter your details, one entry per person. Closes at 11.59pm, 13 May 2019. TripADeal - Win a trip for 2 to Mexico! TripADeal is giving away a trip for two people to explore the best of Mexico. Discover the highlights of beautiful Mexico with a friend, visiting Chichen Itza, Puebla, Oaxaca City and more, valued at $11,998! For your chance to win, simply enter your details. Open to NSW, QLD, VIC, WA and SA residents of Australia who are over the age of 18. Only one entry per person will be permitted. Closes 15/5/19 at 10:00 AM. Escape - Win a Luxury trip for 2 to Tahiti worth $20K! Win a Luxury escape to Tahiti for 2 people valued at up to $20,000! Simply subscribe to the My Escape newsletter and tell us why you would love to Escape to Tahiti. The most inspiring response wins! Australian residents 18 years and over only. Only one entry per person. Closes 19/5/19 at 9:00 (AEST). Courier Mail - Win a South Pacific Cruise for 6 valued at over $18k! Explore the stunning sights of the South Pacific with a 12 night Fly, Stay & Cruise holiday for you and 5 friends! Thanks to My Cruises, you and your loved ones will enjoy a jam-packed adventure travelling from Sydney to New Caledonia and Vanuatu onboard Carnival Spirit, while unwinding in the luxury of your all-inclusive My Cruises experience, valued at over $18,000! Enter your details for your chance to win! Open to all residents of QLD, NT & NSW. One entry per person. Closes 12/5/19 at 11:59pm AEST. The Chase - Win what the contestants Win! The Chase Australia is giving you the chance to win what the contestants win. Make sure you enter by 4pm each day for a new chance to win, then keep watching to see if you will walk away with handfuls of cash. It's that easy! The daily winners name will be shown on screen each day during The Chase Australia, starting Monday 29 April, concluding Friday 3 May 2019. Even if the contestants on the show lose, there is still a minimum $1,000 prize each night up for grabs for home viewers. Don't miss out, enter for Monday's draw now. To Enter - SMS: Send a text message/SMS and register with your full name and postcode to 19 777 377 (Charge $0.55 - Helpline 1300 851 419); or CALL: Telephone 1902 55 77 03 (Charge $0.55 fixed - Helpline 1300 851 419) and state your full name, address (including postcode) and contact daytime telephone number (including STD area code). Closes 3/5/19. Jeep - Win the ultimate surf experience for 2 in Hawaii! Join us on the road to Hawaii - Enter your details for a chance to win the ultimate surf experience in Hawaii, for you and a friend. Prize includes return economy airfares from your closest capital city, 7-nights accommodation, a VIP site tour and WSL merchandise pack for two - worth $11,160. Entries close August 31st. Homes to Love - Win a Coco Republic 'Ashley' sofa valued at $5,395! For your chance to win a Coco Republic 'Ashley' sofa, valued at $5395, vote for your favourite project in our Best Residential interior - Readers' Choice competition. View the 10 shortlisted projects and keep scrolling to the competition form where you can select your top pick, enter your details and go in the draw to win! AU residents 18+. Closes 15/5/19 at 11:59 AEST/AEDST. Clipsal - Win the ultimate electrical & smart home package worth $20,000! Master your castle with the ultimate electrical and smart home package, valued at $20,000, for your new build or reno project. Receive a Clipspec consultation to design the ultimate customised electrical package, tailor-made for your home. Walk through your house plans with an expert and select $15,000 worth of Clipsal electrical products. Then receive $5,000 towards the installation of your selected products. To enter, fill out your details in the competition form at the top of the home page. Entry is open to Australian residents over the age of 18 only. Closes 20/11/19 at 9.00pm (AEST). iHeartRadio - Win a trip for 2 to the 2019 Wango Tango Event in LA! Want to see the hottest music line-up in Los Angeles this June? We've got you covered with the ultimate experience for you and a friend - fly you to Los Angeles, provide five nights accommodation, give you $1,000 spending money and send you to the iHeartRadio Wango Tango, valued at up to $8,600! For your chance to win, simply enter the form. Upon completing the entry form, you will also have the following opportunities for bonus entries! Click on the iHeartRadio Countdown icon to listen to the station and you will receive an additional competition entry! Click on the Facebook and Twitter share icons and gain a bonus entry for a friend who enters the competition via the links you shared, with up to one extra entry up for grabs per social channel! Closes 20/5/19 at 12.00pm AEST. Brandleaders is offering you the chance to Win $125,000 Cash! The world is truly your oyster! Spoil family and friends, or spoil yourself with a well-deserved holiday. Enter now, it's completely free! Backpacker Deals - Win a trip for 2 to the Red Centre or Top End! Win a trip to the Northern Territory! We're giving away a trip for two to the Red Centre or Top End! To enter: Tag 3 friends you'd love to explore the NT with Tag @backpackerdeals, @ausoutbacknt and #backpacktheoutback in your comment. Follow @backpackerdeals and @ausoutbacknt Prize will be drawn on the 7th June 2019. Wine Selectors - Win an 8-Day Mediterranean Cruise for 2! Uncover and explore the Mediterranean thanks to Viking Cruises and Wine Selectors! You could be sailing the Mediterranean in ultimate luxury! Departing Australia on November 21, 2019, if you're the winner of this once-in-a-lifetime experience, you'll enjoy an 8-day cruise taking in world famous destinations including Barcelona, Montpellier, Florence and Rome. Being the small ship experts, Viking Cruises will take you to places the larger ships cannot, giving you more time to explore these must-see destinations. For your chance to win this Viking Cruise valued at $12,990, simply enter your details. Only open to Australian residents aged 18 years or over. Closes 30/7/19 at 11:59pm AEDST. Universal Pictures - Win a trip to the Top End worth $10,690! Win a trip to the Top End: 2 x return economy airfares from nearest capital city to Darwin; 6 nights accommodation and a self-drive tour of the Top End including Darwin, Litchfield National Park, Kakadu, Ubirr and Cooinda, provided by the Accor Hotel Group; 7 days car hire provided by Thrifty; 2 x Tiwi by Design tours, provided by Sea Link, valued at up to $10,690. To enter, simply fill in the form and tell us in 25 words or less: Why you want to win a trip to the Top End. Closes 1/5/19 at 23:59 AEST. Bachelor in Paradise - Win $10,000 Cash! Tell us your favourite moment from the lastest Bachelor in Paradise episode for your chance to win in $10,000 Cash. Is it the sunsets, drama or just Bill's tongue? Be watching Bachelor in Paradise from 7:30 tonight for your chance to win! Time to bring out the roses ... and enter now. Step 1: Watch Bachelor in Paradise 7.30 Tonight, tomorrow and Wednesday on 10. Step 2: Enter and tell us your favourite moment from the latest episode in 25 words or less. Step 3: Keep watching Bachelor in Paradise for more chances to WIN! Entry is open to all residents of Australia aged 18 years and over. Online limit, one entry per person per day. Closes 5/5/19 at 23:59 AEST. JB Hi-Fi - Win 1 of 3 Huawei P30 Pro Handsets! To celebrate the launch of the Huawei P30 & P30 Pro, we are giving away 3 handsets worth $1599 each! To enter, just chuck us a like, and let us know in 25 words or less why you need this phone! Comp closes 9am April 29th! Vacations Travel - Win a 12-night cruise through French Polynesia for 2! Vacations & Travel magazine, in conjunction with Ultimate Cruising, is giving readers the chance to win a return airfare to Tahiti plus a 12-night cruise through French Polynesia aboard Aranui 5, and a four-night stay at the Manava Suite Resort Hotel in Papeete, Tahiti, valued at A$19,268. To enter, simply sign up to our weekly newsletter. Open Australia wide, to persons aged 18 years or older only. Closes 3/7/19 at 11:00 AM AEST. Click Energy - Win a $3,000 Flight Centre Gift Card! Think you could be getting a better energy deal? See if you could save by getting a quote from Click Energy and you will be in with a chance of winning a $3,000 Flight Centre Gift Card*. Don't delay this draw ends soon. Hit the 'get a quote' button below to enter now, good luck! Open to all residents in Victoria, New South Wales, Queensland and South Australia aged 18 years or older. Closes 30/4/19 at 11.59PM. Harvey Norman - Win 1 of 20 JBL Charge 4 Portable Bluetooth Speakers! For your chance to win 1 of 20 JBL Charge 4 Portable Bluetooth Speakers, valued at $199 each! Simply, tell us in 25 words or less what tune you'd play to get the party started, and why? Closes 26/4/19 at 11.59pm. Rip Curl - Win a trip of a lifetime to Bells Beach for 2! In partnership with Tourism Victoria, Rip Curl is giving YOU the chance to win a trip of a lifetime to Bells Beach, Australia. Score a $2000 worth of flights, 5 nights accommodation and a $1,000 Rip Curl voucher for the ultimate Bells Beach, Victoria trip. Entry takes less than 30 seconds. Closes 30/4/19 11:59pm AEST. FunClub - Win a Samsung QLED TV! Have you been dreaming for flat screen TV on your home? Dream no more! We are here to give you a chance to win a Samsung QLED TV for FREE. Simply, answer a few questions to see if you qualify. Open to all Australia residents aged 18 years+. Closes 30/4/19. Nulon - Win the ultimate 79 series Toyota Landcruiser worth over $150,000! The Nulon79 is a BRAND NEW 2018 79 series Toyota Landcruiser, modified and upgraded to be one of the most complete 4x4's on Australian roads and one lucky Nulon fan will win this amazing 4x4 valued at over $150,000. Make sure you enter online and for more chances to win purchase any Nulon product and upload a copy of your receipt for 20 bonus entries! Open to Australian residents 18 years or over. Closes 31/7/19 at 23:59PM AEST. Sunrise - Win a trip to Honolulu to meet Why Don't We! The American boy band released their debut album last year and recently dropped hit song "I Don't Belong In This Club" with music superstar Macklemore. Now we're giving you the chance to meet Daniel, Jonah, Jack, Zach and Corbyn on their sold-out 8 Letters Tour in Honolulu next month! The prize includes return flights to Honolulu, 4-nights accommodation, tickets to the show and a meet and greet, valued at AUD$5,700. To enter, all you need to do is create a video showing us why you're Australia's biggest Why Don't We fan. Closes 26/4/19 at 11.59pm (AEST). Viking Cruise - Win a 15-day Far East Discovery cruise for 4! Enter now for your chance to win this spectacular ocean cruise, travelling from Beijing to Hong Kong on board Viking Orion, departing Beijing on 4 October 2019, valued at $38,380. Our lucky winners will spend 15 days experiencing the colourful cultural tapestry of Eastern Asia, from Hong Kong's bustling markets and the unrivalled views from the Great Wall of China, to the lush terrain and turquoise waters of Japan's Ishigaki Island and the many parks of one of China's most liveable cities - Dalian. Want more chances to win? Refer your friends when you enter, and if they win, they might choose you to join them! Entry is open to residents of Australia and New Zealand, aged 18 years and above. Closes 30/6/19 at 11.59pm (AEST). My Kitchen Rules - Win a Renault Koleos Life valued at $30,990! Renault is a brand that stands for passion, tenacity and creativity. We are proud to support the teams of MKR who are putting it all on the line to live their BIG LIFE and follow their passion for cooking. Live your BIG LIFE by entering the competition to win a Renault Koleos Life valued at $30,990! Simply submit your details to enter. Open to all residents of Australia, who are aged 18 years of age or older. Closes 5/5/19 at 23:59 AEST. 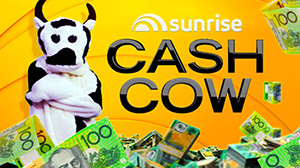 Sunrise Cash Cow - $30,000 Jackpot Friday! The Cash Cow is back for 2019 and she has stacks of cash to give away! Just make sure you pick up within 3 rings to claim your cash! Get in extra quick to WIN your share of $1,302,000. Be watching Sunrise every morning for your daily code word, then: Call 1902 55 77 07 ($0.55 fixed - Mobile calls to 1902 extra) and register the daily code word with your details. Or SMS the daily code word and your full name and address to 19 777 077 Entry charge $0.55. Ansible Pty Ltd Helpline 1300 851 419. Make sure you're close by your phone each day in case we call you. Answer your phone within 3 rings and you will win $10,000...or more if the amount jackpots! Draw closes at 4.30pm AEDT each day. Ends: 28/6/19 at 16:30 (AEST). Win a $5,000 Myer gift card! MyEssentials is giving you the chance to Win a $5,000 Myer gift card! Enter now for your chance to win! Good luck! Today Mega Cash Giveaway - $30,000 Jackpot Friday! TODAY will be giving one lucky viewer each day the chance to participate in the Mega Cash Giveaway. A daily code word will be advertised during TODAY. Upon answering the call within THREE RINGS, the winner must state "I wake up with TODAY". If the person called answers the phone within THREE rings and answers correctly by saying "I wake up with TODAY", they can win a minimum of $10,000. If the person answers the call incorrectly, the $10,000 jackpots to the next day. To enter: Call: 1902 555 901 $0.55 fixed (Mobile calls to 1902 extra) Or SMS your full name, the daily code word and your full address to 199 55 901 Entry charge $0.55. Mercury Helpline 1300 914 815. Ends 30/5/19 at 23:59 AEST. Yahoo!7 - Win the ultimate sports trip to NYC! Are you ready to experience some of the greatest moments in sporting history? All you need to do is sign up to the Yahoo daily newsletter for a chance to win! The prize includes: $5,000 Flight Centre voucher and x2 tickets to 3 events, valued at AU$6,163.84. Entry is only open to Australian residents aged 18 years or over who are not already subscribed to The Daily Snapshot eNewsletter. Only one (1) entry is permitted per person. Closes 19/5/19 at 11:59pm AEST. FunClub - Win an iPhone Xs & iPhone Xs Max! Grab your chance to take home iPhone Xs and iPhone Xs Max here! Simply, answer a few questions to see if you qualify. Open to all Australia residents aged 18 years+. Closes 30/4/19. Optus Perks - Win a trip for 2 to see the Spice Girls in London! Start warming up those vocal chords because you and a friend could be jet-setting to London to see the Spice Girls perform live at Wembley Stadium. Prize includes: 2 tickets to Spice Girls at Wembley Stadium; Return economy flights for 2; 7 nights accommodation in London; Travel insurance; $1000 prepaid Visa card - valued at up to AUD$18,530. AU16+. Must be an eligible Optus customer with an active Optus Service. Max 1 entry/person. Ends 16/5/19 at 11:59pm AEDT. To celebrate the launch of our Autumn Winter Fashion magazine, we're giving one lucky person the chance to WIN a $1,000 Pacific Fair Gift Card for a new Winter wardrobe. Simply complete the form to enter! Multiple entries permitted per person. Open to Australian residents aged 13 and over. Closes 4pm 31 May 2019. Smith's Fortune - Spin to Win up to $1 Million! Over $1 Million in instant Cash prizes to be Won! Instant prizes: 30 x $1000, 7000 x $50, 32,500 x $20. Major prize: Chance to Spin To Win Up To $1 million. Total prize pool: up to $2.031 million. To enter, purchase any one (1) pack of participating Smith's Chips from any participating store in Australia and follow the prompts to the promotion entry page. Open to AU residents 18+ only. Max. 1 entry per pack & total 3 entries per person per day. Retain receipt/s. Closes 1/6/19 at 11:59pm AEST. Caravan Industry Association - Win a Ford Ranger & a Jayco Adventurer Off-Road Caravan! Win a 2018 MS-RT Ford Ranger XLT PX MkII 4x4 3.2L Auto MY18 Double Cab Ute and a Jayco Adventurer 19.6-2 19-feet Off-Road Caravan, worth $206,490! To enter, tell us in 25 words or less: If I won The Bullish Adventurer I would...? Entry is open to all residents of Australia over the age of 18. Closes 30/6/19 at 11.59pm AEDT. 4x4 Australia - Win a 4x4 trip for 2 to Cape York! We're giving away a guided 4x4 trip for two to Cape York, during the period of August 8 to August 21, 2019. The incredible experience, valued at up to AUD$11,800, will be led by 4X4 Australia's very own Ron Moon, an Aussie off-road expert. By travelling with Ron, winners of the major prize will discover Moonie's best-kept secrets, as well as benefit from his expansive knowledge of The Cape. Plus two runner-up prizes will also be available, with tyre prize packs up for grabs. For your chance to win, simply subscribe to 4X4 Australia for 100 entries or enter your details for one entry. Entry is open to Australian residents aged 18 years and over. One entry permitted per person. Closes 29/5/19. Hisense - Win a new 453L Black Steel Bottom Mount Refrigerator! To celebrate the release of the new Hisense 453L Black Steel Bottom Mount Refrigerator, we're giving away one fridge to a lucky winner! To enter simply complete your details and could be the lucky recipient of our brand new 5.5 Star energy efficient fridge, valued at $1,699 RRP. End: 30 Apr 2019 11:55 PM AEST. Rockwear - Win 1 of 12 $1,800 Activewear wardrodes! Win activewear for a year - 12 winners worth over $20,000, sign up to our newsletter for your chance to win. End: 25/4/19 at 11.59 PM AEST. Cruise Passenger - Win Premium Economy flights to Europe valued at $12,000! Cruise Passenger, with Singapore Airlines, is offering readers the chance to win a pair of roundtrip Premium Economy Class tickets from Australia to Europe, valued at $12,000. To enter - Answer correctly to qualify: What is the name of Singapore's major airport? Answer: Changi Airport. Closes 10/5/19 at 2:00pm AEDT. WhichCar - Win a trip for 2 to the 2019 Tokyo Motor Show! We're giving you the chance to win a return trip for two to Tokyo Motor Show, valued at nearly $20,000, includes premium economy flights, tickets to the Tokyo Motor Show in October and 7 nights' accommodation for 2 adults in the nation's iconic capital + $5,000 spending money. To enter, subscribe to one of our great motoring magazines or simply complete the free entry form and you could be front and centre at the next Tokyo Motor Show. Open to AU & NZ res 18+. Ends: 11.59pm AEST 15/7/19. Kia - Win a trip of a lifetime to Paris! Kia Tennis Passport gives you access to win a trip of a lifetime, throughout 2019. Five lucky winners have won the chance to watch the Australian Open 2019 semi-final. Now another lucky winner will win a trip to Paris, France valued at $11,650 AUD. Simply enter your information in the form for your chance to win Closes 30/4/19 at 16:30 AEST. Sandler - Win 3 Free Pairs of Shoes! Wow! The year has gone by so quickly already - and as we move into Autumn what better way to update your look than with 3 free pairs of shoes from the AW '19 line (also now on sale)! Sign up to our newsletter list for your chance to win (Aussies only)! Refer a friend via your unique link, and get 3 additional entries. Limited time only! Closes 1/5/19 at 12:00am UTC. SABA - Win a $1000 Wardrobe! Simply complete the form to become a SABA VIP and enter the draw to WIN a $1,000 wardrobe. Each Month, every new VIP who has joined that month is entered into the draw to win a $1000 wardrobe. Total Prize Pool $12,000. Open to Australian and New Zealand residents aged 18 years or over. Closes 31/5/19. Win a $5,000 JB Hi-Fi gift card! MyEssentials is giving you the chance to Win a $5,000 JB Hi-Fi gift card! Enter now for your chance to win! Good luck!